While a host of Bollywood celebrities lauded Supreme Court's move to suspend the ban in four states on the release of Sanjay Leela Bhansali's period drama Padmaavat, Saif Ali Khan had a rather royal take to offer on the situation. In an interview to News18, Khan said if a filmmaker decides to make a film on a queen then he should be cautious of portraying her accurately. "You can't appropriate history. You can't say she did this, did that. It's safer not calling her that." Khan refers to the song 'Ghoomar' which invited the ire of Shri Rajput Karni Sena and even the royal family of Jaipur, who alleged that the central character's depiction was historically inaccurate as she never used to dance in front of a court. She only watched dances, like a Rajput queen was expected to. Khan quoted a few examples to substantiate his argument. "If you make a film on Tiger Pataudi (his late father), then you might as well be honest to what he was. 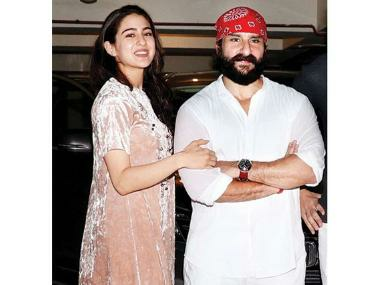 If you are not then you might offend his family," said Saif to News18. He also quoted the famous example of Salman Rushdie's The Satanic Verses and his Kaalakaandi director Akshat Verma's satirical take on the Ramayana, which also created an uproar among the respective fringe groups. "I don't even know if it is fiction, and the line between fiction and facts is blurred. So there are certain topics, certain areas," said Khan to News18. Meanwhile, Karni Sena continued their nationwide protests against the film's release. They even threatened to bar Central Board of Film Certification (CBFC) Chairperson Prasoon Joshi from entering the Jaipur Literature Festival where he has a session on 25 January. They alleged that the CBFC cleared the film for release with minor cuts and a U/A certificate without the unanimous consent of the advisory panel comprising four historians from Rajasthan. Additionally, Karni Sena also threatened to not allow Bhansali to shoot any film in Rajasthan in the future. They will also appeal to double bench of the Supreme Court for a blanket ban on the film. Pamdaavat stars Deepika Padukone, Shahid Kapoor, Ranveer Singh, Aditi Rao Hydari and Jim Sarbh. It is co-produced by Bhansali and Viacom 18 Motion Pictures. It is slated to release 25 January, the eve of Republic Day, along with R Balki's social drama Padman.